my cute little boys today. to lay on my back for so long while they look at them. and Baby B is measuring 3 lbs 11 oz. They are both growing on track and are looking good! I love when i get good news every time i go in for an ultrasound. I just feel so relieved and blessed that they are doing so good. the ultrasound with me and check me out. I am already partially on bed rest since my cervix has been thinning. but it will all be worth it when these precious little boys come. 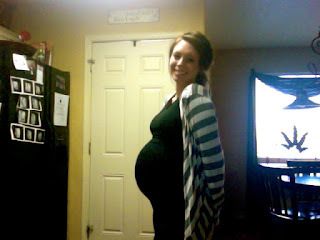 I am totally in that UNCOMFORTABLE stage of pregnancy. when the babies are here and having to be up all night with them! been difficult to walk or even sit in different positions. I seriously don't think my belly can stretch anymore. isn't that big for having twins in there. I wouldn't trade being uncomfortable or in pain for anything though. My little boys are worth it all. i haven't been able to see anyone for awhile there so i am really excited! this weekend too and i can't wait for that one either! These little boys are so spoiled already. and we couldn't be more grateful. We are so blessed in so many different ways. These little boys can't wait to love on you all when they get here! you are so tiny alyssa!! I have followed your blog for awhile now and think its so adorable and im so glad the boys are growing and healthy!